Speedster Hobbies, just outside of Austin, TX, hosted the RC Pro Southern Indoor Nationals this past weekend. Team Associated/Reedy/LRP drivers Chris Jarosz and Kyle Skidmore made the trek to Austin from Southern California and Oklahoma. Four rounds of qualifying were run on Sunday along with Triple A Mains for the Modified 4WD and Truck classes. Jarosz, running a B44.1 powered by LRP electronics and Reedy batteries, would go on to TQ the first three rounds of qualifying by a considerable margin and elect to sit out the fourth round to prepare his buggy for the Triple A Mains. 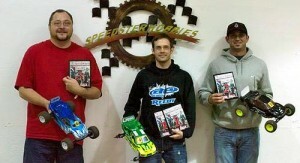 Chris would then go on to easily win the first two A mains and lock up the 4WD Modified title. Skidmore put on a clinic in the Modified Truck class, setting the fastest time in all four qualifiers. Kyle’s Factory Team T4.1 was hooked up on the high-bite clay track, and his LRP motors and Reedy batteries put the power down smoothly. 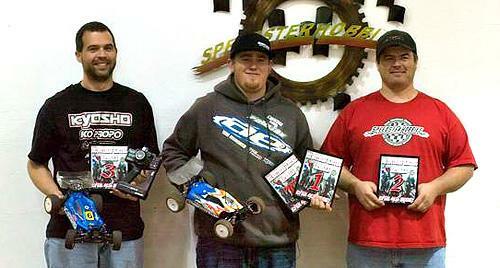 Kyle won the first two A Mains and gave Team Associated/Reedy/LRP the second title of the weekend.